The significant filing fees spent by an accused infringer on a successful American Invents Act (AIA) review are not taxable as costs in the underlying district court patent litigation, according to the January 5, 2016 decision [pdf] in Credit Acceptance Corp v. Westlake Services. In Credit Acceptance, the district court refused to tax as costs the $73,200 in filing fees paid by the accused infringer and prevailing party Westlake to the U.S. Patent and Trademark Office in successfully challenging Credit Acceptance’s patent in an AIA review. Although the ruling goes against the general shift of both the Courts and Congress to increasing the financial risks of bringing unsuccessful patent litigation (this in service of the underlying policy of reducing the number of frivolous patent litigations), it appears to have been correctly decided. For the last few decades, corporations ranging from startups to large multinationals first turned to utility patents to protect their innovative software. These patents protected everything from the minute details of microprocessor operation (e.g., Intel’s microprocessor power consumption patent) to algorithms for a search engine (e.g.Google/Stanford’s page rank patent) to innovative user interfaces (e.g.,Amazon’s “one-click” patent). 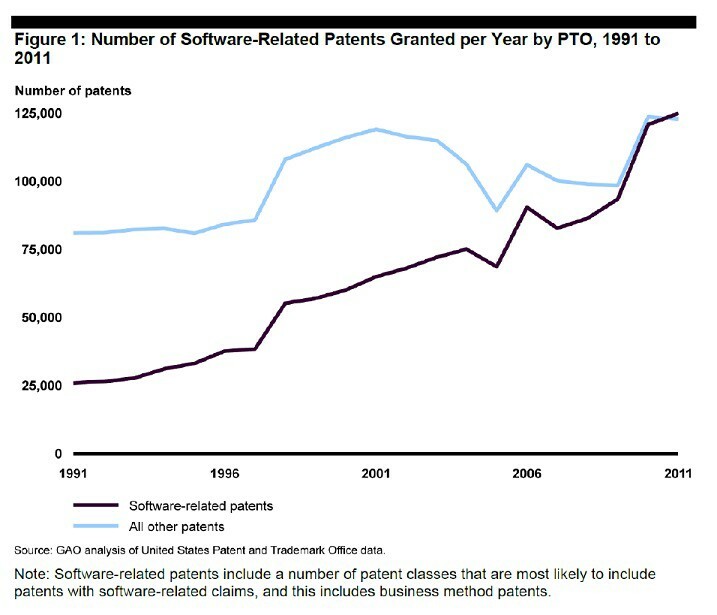 In fact, by 2011, patents on software made up more than half of all patents being issued. See the August 2013 report from the Government Accountability Office on Intellectual Property here. Patent case filings have been generally higher in the first five months of 2015 than in the last 8 months of 2014. May of 2015 had the most patent cases filed on any month so far this year (606 cases). Lexmachina.com/blog, July 10, 2015, Fig. 1: Patent cases filed Jan 2014 through May 2015 (2015 in orange). But why are we seeing this recent increase in patent case filings? Isn’t this surprising given legislative, court, executive and administrative developments that have made it much more difficult to successfully sue for patent infringement? Nope. In Rush to Invalidate Patents at Pleadings Stage, Are Courts Coloring Outside the Lines? OIP Technologies v. Amazon.com and IPC v. Active Network are the most recent of a growing number of decisions dismissing software and business method patent lawsuits on the pleadings. In these decisions, the courts are finding that the invention alleged in the complaint is an abstract idea that is not eligible for patent protection. While early resolution of patent litigation is laudable, motions directed to the pleadings generally may not consider matters outside what is pled in the complaint. Yet this is what courts are doing — they have been coloring outside the lines when deciding whether a patented software or business method is an ineligible abstraction. They are looking beyond the allegations in the complaint to discern “fundamental economic concepts.” Independent of anything pled in the complaint, they are making historical observations about alleged longstanding commercial practices and deciding whether the claimed invention is analogous to such practices. Now that it is easier for prevailing parties in a patent litigation to recover attorney fees [see our previous post], how likely is that that fees paid under some form of non-hourly arrangement – for example flat fees, contingency, success fees or some other alternative fee arrangement (AFA) – can be recovered? The answer is that the court’s end-of-case determination of a reasonable hourly rate and fee, called the “lodestar,” trumps the amount paid under any AFA. While the fees awarded to Sidense are significant, they appear to be less than half of the fees that Sidense actually paid its counsel under a contingency bonus arrangement. Sidense’s fee arrangement called for Sidense to pay 50% of its lawyer’s hourly billing on a monthly basis, with the remaining 50% held back until the end of the case. The payment of the holdback was tied to a performance based multiplier. Since the court granted summary judgment in Sidense’s favor and dismissed all claims, Sidense’s counsel was entitled to the maximum multiplier of 2.5x, effectively requiring Sidense to pay 175% of its lawyers’ standard rates. While the public record does not disclose the full amount of the contingency bonus, what can be inferred from the decision is that the fees paid by Sidense under the contingency arrangement exceeded $11 million (based on inferred standard rate fees of $6.5 million). District Courts have begun to implement the new standard and the results are noteworthy for a number or reasons, not the least of which is whether and how fees are awarded where the prevailing party has paid a flat fee to its counsel (a fixed or set amount via lump sum or installments) as opposed to hourly fees.